Disclaimer: This post contains an affiliate link. Any purchases made through this link will result in a small commission to me. All ideas and opinions are my own. With three boys in the house, we truly have an overabundance of Lego everything. I have been going back through some old pictures and found these from Perry's 9th birthday and thought I would share them. 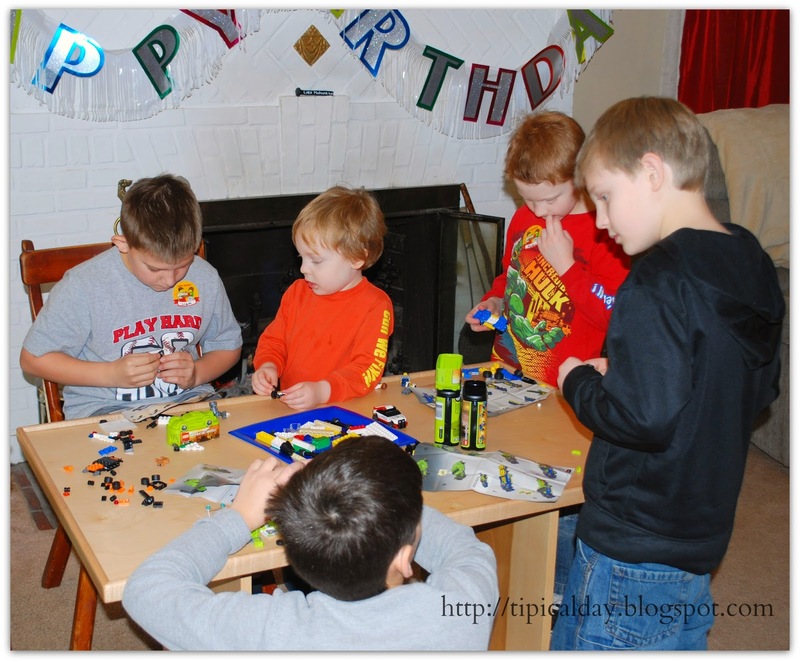 This Lego party was a huge hit with my boys. Perry was very involved in the planning for this and begged me to do the exact same party the following year. 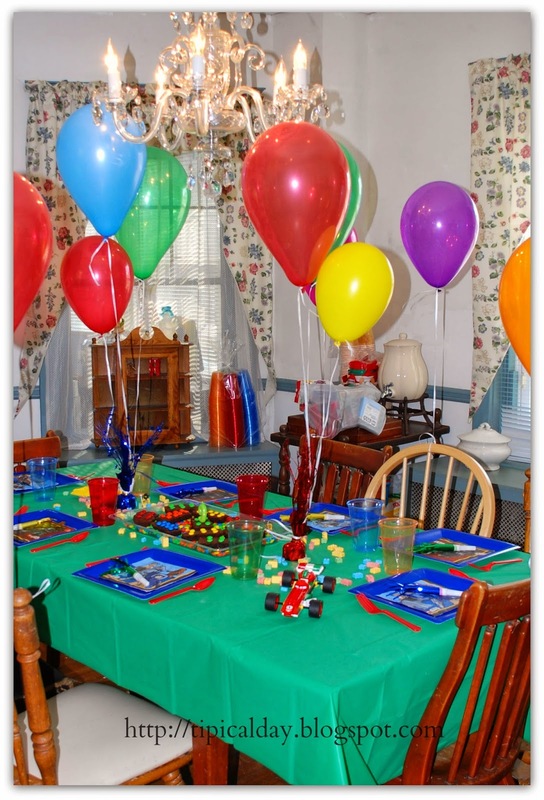 Since I am always on a tight budget when it comes to parties, I have to think of the most frugal ways to host. Decorations for a Lego party can be so simple. We grabbed some Lego cars, figures, and pieces and just set them out all over the party area. I did invest in a balloon tank at BJ's Wholesale. I had found it on sale for about $19.99. That was my one of my biggest purchase for this party. It came with the balloons and we were able to blow up about 30 - 50 balloons. We put some outside and then put them all over inside. It goes a long way to making the house look festive. 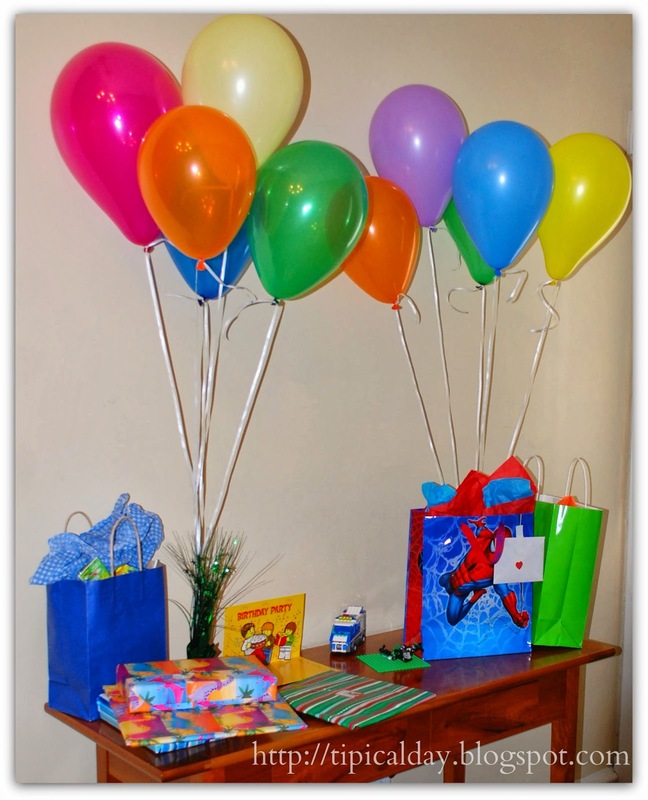 I recycled some older balloon weights and birthday banners we had from previous parties. I always try to hang on to those types of things for this purpose. Upon arrival to the party, Perry greeted each boy with a small Lego car kit. They were all different. 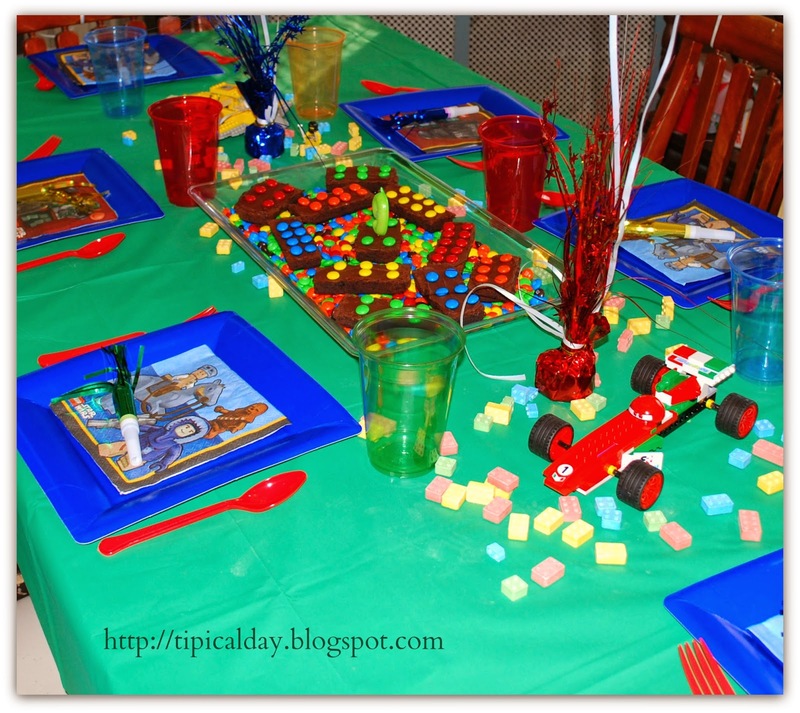 The boys sat down at our Lego table which we had moved to our living room for the party and played for a long time. I actually had to encourage them to finish so we could move on to the other games at the party! I will note that Perry bought all of the kits with his own money. I had suggested that he just use some of the gobs of Lego from his stash but he insisted that he needed to buy these kits. He allowed the boys to take the cars home as part of their gift bags. After the boys finished making their cars, we went outside to race them on a homemade Derby track. This was interesting with Lego cars, but again the boys all seemed to enjoy it. While the boys raced, I set up a pinata. We did end up getting a store bought one for this party, but I have made them too. I actually prefer making them. It is so much cheaper, not to mention ridiculously easy to make! Our store bought pinata actually busted with the very first swing, so we ended up letting the boys just run around the yard for awhile to burn off some energy. Back inside I set everything up for lunch. We had pizza, popcorn (of course) and fruit cups. On the table we had set out some more Lego cars. Perry and Buzz found some really cute Lego candy at the farmers market and put that around the table. We couldn't find any plan Lego tableware, so I just used multicolored items that I picked up from the dollar store and BJ's Warehouse. I tend to keep a large supply of paper products in the house because we have so many occasions that they come in handy. I just find it easier to buy it in bulk, which meant I had some of this on hand already. I did find some Lego Star Wars napkins, so Perry asked if we could use them. 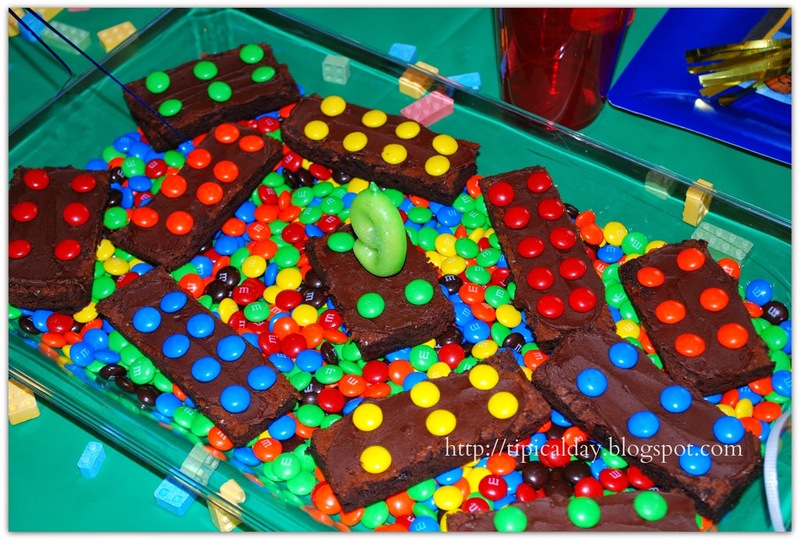 Instead of cake, I made brownies and decorated with chocolate icing and M&M's to look like a Lego. Perry was thrilled with these as brownies are one of his favorites! I placed them on the middle of the table as a centerpiece and just had them all sitting on a tray of more M&M's. 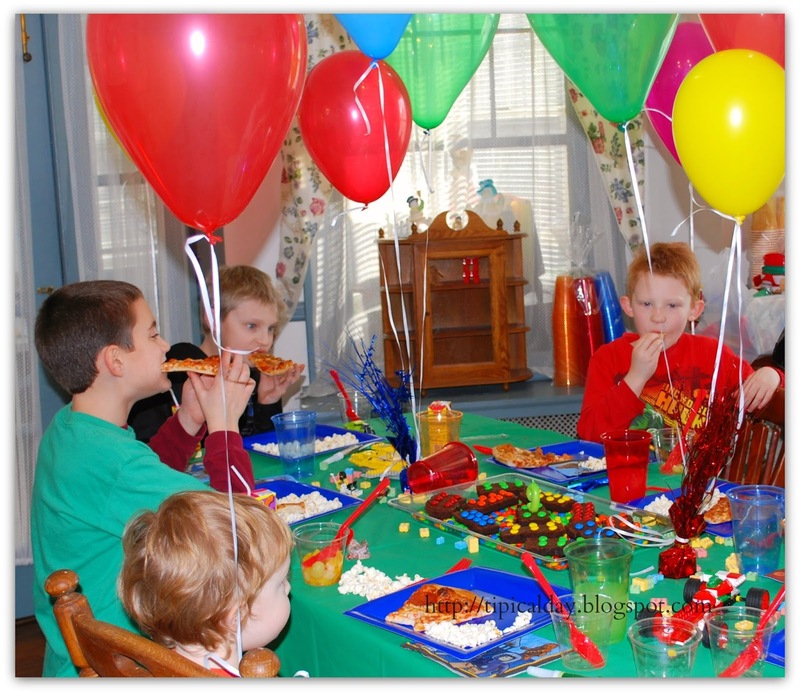 Each of the kids had a party horn on their plate (something I later regretted). A word of advice, skip the party horns! They will drive you crazy, and with young boys, if they know it is getting on your nerves, they will do it more! This is Pumpkin. She was about 18 months at the time. I just had to include this picture because she was having such a good time at her brother's party (and she is so cute)! 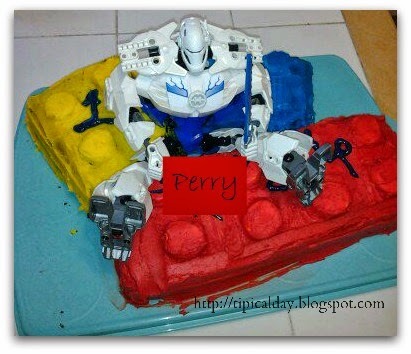 After the Party, each boy was given a gift bag that Perry had decorated to look like a Lego piece. It contained mostly candy but it also had some Lego stickers and a Lego mini figure. As I mentioned earlier, Perry asked to have the same party the following year. We opted to just have family over, but this was the cake I made him. It is not my finest work, but he loved it. I am all about using what I have, and I wasn't crazy about how the middle of the cake looked. So, I grabbed this Hero Factory guy, gave him a quick wash and threw him on the cake. I stuck the birthday candle in his hand and my boys thought that was great! 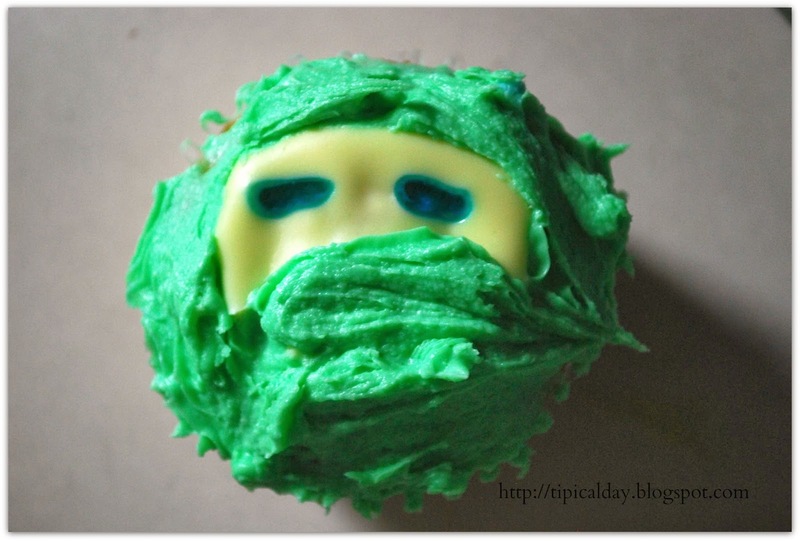 For Bud's last birthday he wanted a Ninjago cake. I have to laugh at this one. Seriously, I hear womp, womp, womp, wooomp every time I see it! This was my epic fail in the cake decorating department. Pretty funny since it is probably the most simple design ever, but I could not get it right for some reason! LOL Oh well. 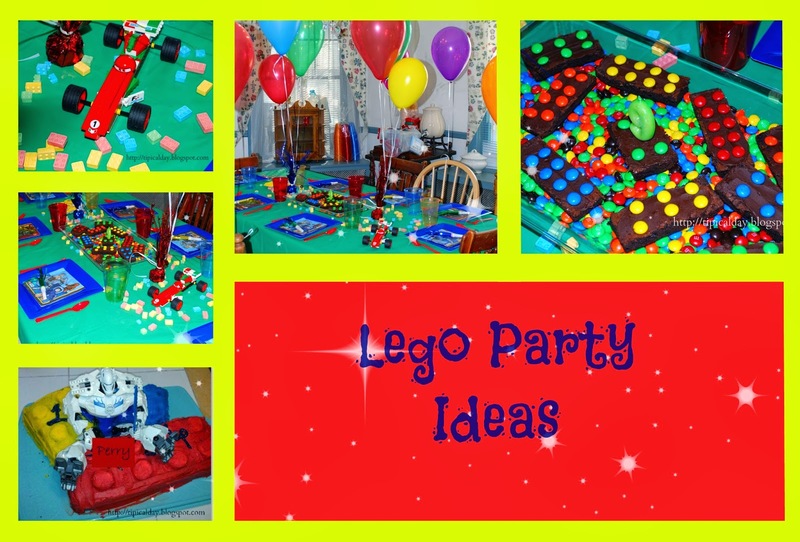 My kids love Legos and would really enjoy a Lego themed party. It looks like your kids had a great time. 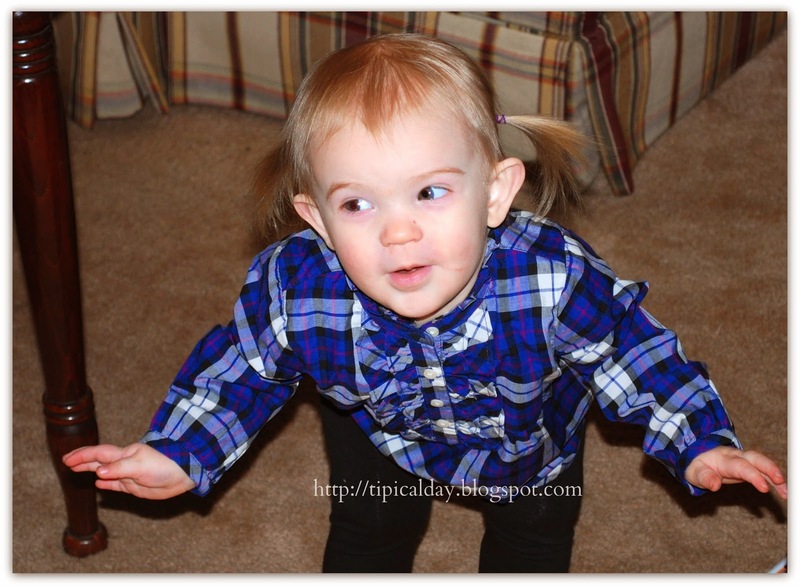 Thanks for sharing this with us at Let's Get Real Friday link party. I hope you'll join us again. Hi Nicky, Thank you for your comment! Yes my kids had a great time at this party. I was actually glad they had picked Lego for the theme because it was so easy to plan! There are so many easy things you can do with a Lego theme! Such a great party idea! 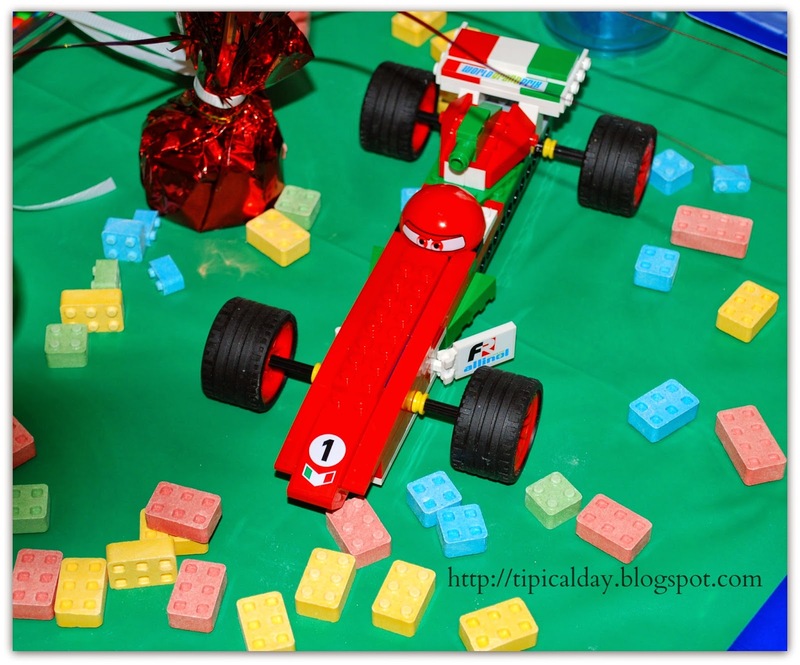 My boys loved Legos when they were little, and this party would have been a big hit. Thanks so much for sharing it with the Let's Get Real party. 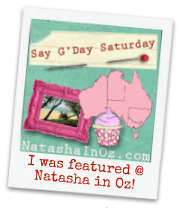 Thanks for sharing your Lego party post at the Say G'Day Saturday link up. I have shared your post on Pinterest and Google+. It looks like it was a great party!